Page 7 of ‘I Have Decided’. This is the image of Jesus’ disciples watching his ascent into Heaven. 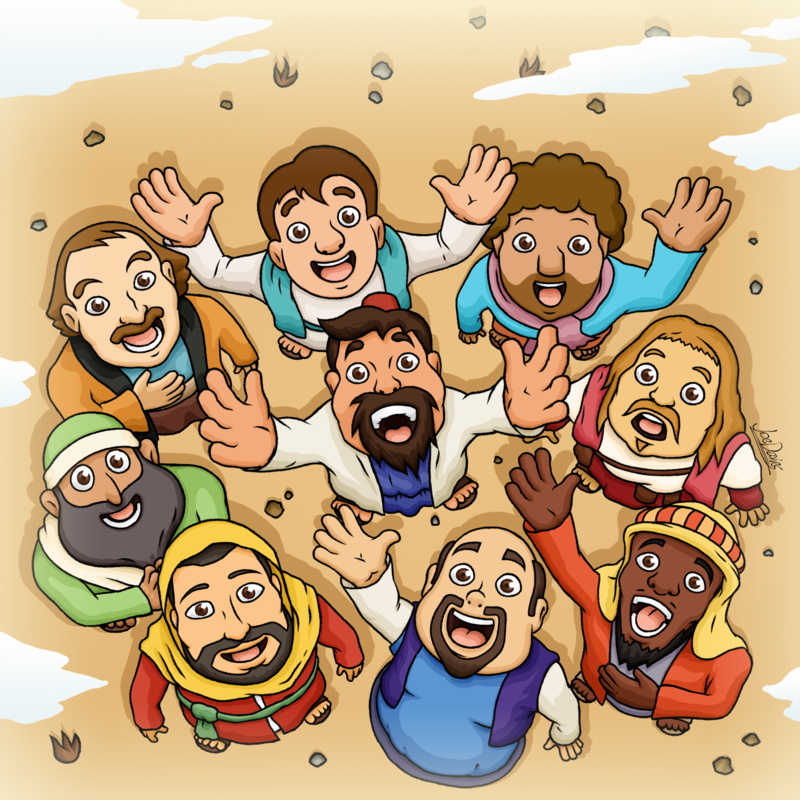 Katy Hailes was already convinced that she wanted to get a first-person view of Jesus looking down on his disciples as they all waved goodbye to him. The tricky part was drawing them all into one image. Luckily this one didn’t need to be a double-page spread, because I somehow made it work. I didn’t think how they looked would be too important, but Katy asked that each of them have a different facial hair design, and also that they all have brown eyes. I’m still not sure why, but I complied anyway. For variety’s sake, I also wanted to show each disciple reacting and posing in a different way. Not too different, as they are all wishing Jesus a fond farewell all the same, but you know what I mean; different hand gestures, different clothing and different head shapes. There’s a little bit of space left at the top to make room for the text that will accompany this image in the book. I also put in some clouds around the image, as per the passage of the Bible, about how clouds wrapped around Jesus upon his ascension into Heaven.